The Society for Northwestern Vertebrate Biology is the longest running scientific association devoted to the study of vertebrate ecology in the Pacific Northwest. Our society strives to promote professional working relationships among ornithologists, mammalogists, herpetologists, and ichthyologists in our region. Please explore our website and be sure to check out our flagship publication, Northwestern Naturalist. If you share our passion for learning about the natural history and ecology of the Northwest consider attending our annual meeting, a great place to meet new people while learning about research that is currently being conducted in our region. 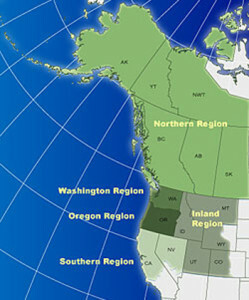 The geographic scope of SNVB and its flagship publication, Northwestern Naturalist, is northwestern North America west of the Great Plains and north of the Mojave Desert. We are divided into five regions and our board includes an elected Vice President from each region. The Society for Northwestern Vertebrate Biology was founded in 1920 as the Pacific Northwest Bird and Mammal Society. Long recognized as the preeminent union of ornithologists and mammalogists in the Pacific Northwest, the society adopted its current name in 1988 to reflect an expanded taxonomic scope that included amphibians and reptiles. The scope expanded again in 1999 to include fish. Today the society strives to promote close working relationships among ornithologists, mammalogists, herpetologists, and ichthyologists in our region; foster exchange of scientific information and interest in the study of vertebrates; and offer a forum for these activities through meetings and publications.